In most of my examples of small savings adding up over time, I assume that you the saver are not only saving the money, but investing it for some compounding gains. For example, I once stated that saving $25 per week by skipping a restaurant meal adds up to about $19200 after 10 years. To get numbers like that, I’m assuming that someone is investing the $25 each week into an imaginary investment that goes up in value a little bit each month, for a total gain of 7% per year. Without this compounding, the $25 per week would still add up to a big number.. but it would be $13,000 instead of $19,200. Is this realistic? Many people have questioned my optimism. And others have questioned my pessimism: Dave Ramsey always repeats the phrase that “the stock market average return has been 12% for the past 70 years, so why am I using 7%? To the credit of the pessimists, it is true that a person investing a monthly series of payments into US stocks over the ten years leading up to right now, June 6th, 2011 would have only yielded 2.3% per year compounded. After adjusting for inflation, it’s even worse: the investment is worth less than 1% more than it was ten years ago. 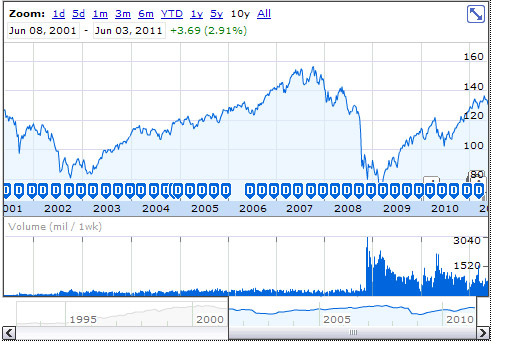 As you can see, the stock index is now very close to where it was ten years ago. The only thing that provided even the tiny 2.3% annual return I mentioned was the quarterly dividends you would have received (adding just under 2% per year), and a small benefit from dollar-cost averaging (by buying, say, $1000 per month of shares, you would automatically end up buying more during the months stocks were in the bargain bin, like in 2002 and 2008). So with the stock market being so volatile, how can we be expected to use it as a short-time retirement planner? Unfortunately, I cannot offer any guarantees. But I can offer an interesting example of how statistically unlikely this is to happen in any given 10-year period, loosely paraphrased from a stock market book I happen to be reading right now. Imagine you could fly freely back and forth to any year between 1950 and today. And you could test out the stock market returns for all possible periods in that range. For example: measure the return for a one-year period beginning in January 1950, ending in January 1951. Then measure from February 1950 to February 1951. And so on, through all the many hundreds of possible hypothetical 1-year investments. Then repeat this whole test for all possible 5-year holding periods. And 10-year periods. And 15, 20, and 25-year periods. After adjusting for inflation, this 11.1% annualized number would become 7.16% over the 1950-2011 period. (Inflation was very high during the 1980s, so it averages to 4% in this example instead of the 2-3% currently forecast for our own future). So what do you do if you happen to hit the wrong 10-year period and your savings don’t grow as expected? Having done much of my own retirement saving during the past decade, I’m in this boat myself. The solution I like to use is to just remain flexible. I did end up working longer than originally planned because of the stock market fluctuations, and during lean years of the stock market, I decided to spend less rather than withdrawing savings right after the stock market crash of 2008. I also like the idea of keeping a local rental house as part of my portfolio, and always leaving the door open for any amount of part-time work that might be needed. There are also less risky investments that you can make – mixing stocks with bonds or other more stable (but on average lower return) investments is very standard advice for people as they get closer to retirement age. Those mixtures deserve their own articles for the unique situation of a Mustachian Investor, since some of us might be just making their first investment deposit as a new graduate, and yet still be less than 10 years from retirement! But meanwhile, at least we can say this: If you plan for a retirement income that is pretty cushy, say $40,000 per year for a small-to-medium family, you have plenty of fat that can be trimmed in the event of down markets. On average, if the stock market continues its historical performance, your investments will return close to 7% per year even after keeping up with inflation. But to get the full benefit of this 7%, you would need to time your spending strategically: reduce spending if you hit some bad stock market years early on in your retirement. Then you can crank it back up during future booms. If this sounds too complicated, you can of course just work for an extra year and build the portfolio even more. But being a man who thinks flexibility and early retirement are all part of the same package, I prefer to take on a little more risk in exchange for more free time earlier in life. Even during one of the worst 10-year periods in stock market history, I have to report: so far, so good. There is obviously much more to say on the topic of stock investing. I’ve been reading more books than usual on the topic recently, in an attempt to answer various unexpected questions that people have been sending in to MMM headquarters. It has been quite valuable to me to hear so about the situations of many other people. The questions have forced me to learn more for my own benefit as well. And all of it has inspired a whole series of stock market articles, so let the Investing Series begin! Previous Post: Mrs Money Mustache: Eliminating Lady Temptations Next Post: Where should I Invest my Short-Term ‘Stash? Might I ask which book it is you are referring to in the article? Always looking for an interesting read. Of course! It’s the Tenth Edition of “A Random Walk Down Wall Street”. One of the most well-known books about stock investing, but it is unique because the author originally wrote it in the early 1970s, and has been updating it with the latest news on the stock market with each successive edition. I originally read a dog-eared old version from the late 1980s several years ago. This version is from the year 2010, so you get the scoop on what caused the 2008 financial crisis, how to tell if the current market is over or undervalued, etc. Everyone who is serious about lifetime investing should read it, but I also feel compelled to write some of the key points here into MMM, because I know that in reality less than 10% of people will read it. And for those who have/do read it, we can compare notes and learn still more. Will bother you some more about this as soon as I get round to it. I think Ray Lucia’s “Buckets of Money” idea is worth investigating. I’m still digesting it, but his whole plan is based off the fact that there is no 15-year period in which the stock market lost value (as you also show above). The past 60+ years were certainly good for US stock markets. They had the benefit of being part of the only major industrialized nation which was not rebuilding following a major world war; the tailwind from cheap, plentiful domestic petroleum production; an oversized proportion of the world’s GDP; an association with the world’s reserve currency; a highly educated workforce backed by a government priority on education funding; and an ability to consume nonrenewable natural resources at an unprecedented rate. Whether similar factors will back up US (and world?) markets in the next 60+ years is anyone’s guess. Yup, it sure is anyone’s guess. Burton Malkiel suggests in a Random Walk that the next few decades will indeed have returns more in the 7-8% range before inflation. But not because he is trying to predict an end to the modern world’s pace of innovation and economic growth.. simply because the P/E ratio of the market today is too high – it will take the equivalent of several more years of zero returns, or a couple of decades of moderate returns, to bring it back to the historical average P/E rate. The bottom line, however, is that stock returns are powered by “companies making money”, which is in turn driven by “human ingenuity at work in a capitalistic society”. That is an activity that I’m willing to bet will not be slowing down during my own lifetime. It is true that oil production might decline in our lifetimes. I’d certainly welcome that change. But again that presents some interesting opportunities for human ingenuity and economic growth. How much profitable work must be done to engineer a mostly-renewable electric supply, all-electric cars, natural gas power for large trucks, and algae-based kerosene for jets? Or an entirely new set of portable energy systems that make my ideas sound silly and old-fashioned? Our rate of technological advancement is exponential, not just linear. So if a technological problem like an old energy source is the only thing that stands in our way to another 60 years of growing earnings, I’m ready to start placing my bets right now. Also, since oil-burning is our biggest impact on our own ecosystem, we will all become richer if we can engineer ourselves out of it. Some great points MMM. If you haven’t yet, you really should read Kevin Kelly’s latest “What Technology Wants”. You’d find it inspiring, I’d bet. Having to rebuild from a major war need not be bad, because it provides ample opportunity for growth, see the German “Wirtschaftswunder” (economy-miracle). Wow, now that sounds like a classic book! The fundamentals haven’t changed (stock investors should be looking to a chunk of highest-earning company at the lowest possible cost).. so as long as the old 1938 language is not too quaint and formal, it could be quite educational. I’m reading “Technical Analysis for Dummies”. In it, the author notes that technical indicators and stock market behaviour haven’t changed for 100 years, so they are still quite relevant today. Certainly some ideas have been modified and conditions have changed but the human behaviour underlying the stock market is essentially the same. As an accountant I know that accounting is not really about numbers alone, but is about numbers used to describe human behaviour. I find that fascinating. Technical analysis is the same. It’s not about numbers, but about using numbers to describe the daily encounters of people in the stock market. If that sounds of interests, I recommend you read this. I’m pretty sure it’s available in your library. I think we will have a real energy crisis in the world in the next years, with oil prices 100 times higher than today and no real replacement (we will replace part of the energy need but not all of it we also have to get a lot smarter about how we use energy). If this is in 1 or 15 years is hard to say since it is dependent on the rate of growth and other unknown factors. But given most of us have a long life in front of us we should be investing and thinking about what this might mean? How and were will people live? How will people get to work? Will people realy travel to an office? What are the new energy sources? What companies are invesing in them? There are a hundred of these type of questions about the future that might lead us into were we want to invest for the future, however I don’t think we should look backwards for investment advice other than the fundamentals like “invest in a company that makes money”. Nice scenarios .. but I would gladly take the other side of your bet that oil prices will multiply by 100x in 15 years! I think oil runs on a traditional supply/demand curve, where currently the price is low, so demand is enormous and we waste most of what we produce because there are no consequences (people voluntarily driving 30+ miles each way to work in a truck, etc.). With prices even double what they are today, demand would start to shrink drastically, limiting further price rises. Even Car Commuting can easily be done in electric cars (already available, awesome, and fairly affordable).. trucks and trains can run on natural gas, jets can run on biodiesel, and rooftop solar alone can handle most of our electric power needs. All of these upgrades cost more than the current cheap oil, but not 100x more. More like 1.5 to 4 times higher. So that’s my guess on the long-term oil price ceiling: 4x or $400US/barrel. In the even longer-term, these newer technologies will probably fall drastically in price, making energy cheaper than it is today – at least Electrical energy. How’s that for a prediction!? I think my 100 times more is high, but I also think that your 4 times higher is low as i think 400$ is still ‘low’ price for oil. The reason is that firstly natural gas is also a fosil fuel that will run out and other issues with altarnative fuels such as if only a small part of our current fuel needs would be replaced by biodiesel there would be a severe shortage of food in the world. When the production of oil starts dropping off by 3-10% per year we will get smarter about using it and we will also find alternatives but I think that it will not be a fast process and as such the highest price we will see on oil in our lifetime will still be more in the 20-100 times current price range. Maybe the long term price will be lower after the ‘”energy crisis” when we have reset our society to work on less energy. Thoose are my thoughts…. Sadly, I find both of your opinions on this topic somewhat uneducated. While it is easy to rave about “peak oil” and “running out of oil soon” the fact is that the world is awash in oil. Even in the US, where we import most of our oil, there have been enormous discoveries in the last few years (Oil bearing shales in Pennsylvania/Ohio, the Dakotas). It may come as a surprise to you that oil is not contained in underground caves that we drill into and stick a pump in, so allow me to enlighten you on some of the basic concepts. Oil, gas and water deep underground exist only in the pore spaces of rocks. The difference between our shale oil and the oil in the middle east (for example) is that the oil in the ME is in a more ‘traditional” sandstone or limestone. Sandstone/limestone has a higher permeability than shale, which is a fancy way to say that fluids flow easier in high permeability formations. Think of sandstone/limestone as a sponge and shale like swiss cheese. While they both have pores (where oil is held), the pores in the sponge are connected so fluids can flow, whereas the pores in swiss cheese are not, which blocks flow. Extracting oil from sandstone/limestone sounds easier right? It is. For shale, the formation must be “broken” or “fractured” (referred to in the industry as “fracking”) to interconnect pores and ease extraction. This adds an additional cost to the process, and even after completion of the well you will have a lower recovery rate than your average sandstone/limestone well in the ME. I went through all of that to explain that extraction costs vary widely. A country like Kuwait can produce a barrel of crude for around $2, where in the US this figure is more like $30-50…and now you know one of the reasons we import most of our oil. As prices go up, things like shale oil/shale gas, deepwater exploration and production, and all more expensive oil fields become more cost effective, so we produce more from these places. When oil drops in price, they become less cost effective. This can be misinterpreted as peak oil as production lowers when costs come down. Finally, while it’s true that oil works on a general supply/demand basis, it’s actually a false market because much of the people trading and holding oil are not the ones using it. In the last 10 years, people have started using oil (and other commodities) as an investment class. This basically means they trade it like a stock, but they have no intention of ever taking delivery of any of the futures contracts they are trading. As more people do this, it increases “demand” for oil (demand meaning that more people want to own the investment class, NOT the commodity itself) and thus increases the prices, sometimes dramatically. Look at a chart for oil prices over the last 5 years, you will see 30% swings in less than 2 weeks. I hope nobody on this site is uneducated enough to think the global demand for oil can change that quickly, either up or down. In this case, oil is just trading like a tech stock circa 1999-2001 because of traders pumping and dumping oil contracts. If you are interested in learning more, I recommend “Oil’s Endless Bid” by Dan Dicker. The large price fluctuations you have seen in the last few years are NOT real supply and demand swings, they are trading swings as oil falls in and out of fashion in the Wall St. fashion show. Enginerd, you may be surprised to learn that I actually agree with you on all of your oil industry opinions as well. I’ve been reading quite a bit on oil supply and demand factors recently, and it is true that the oil sand and oil shale areas have an unlimited amount of backup oil. In my earlier comment when I suggested $400/barrel as an upper limit on oil prices, I didn’t mean that I actually think it will reach that price and stay there – I just meant that it’s the highest conceivable spike that could happen, given that we have unlimited oil available at production costs of under $50/barrel, right here in North America. Without the crazy speculation that you aptly mentioned, I think the oil price would actually come down even from its current level, then just rise slowly over the decades as extraction costs go up a bit. Now, as an earth-lover and Mustachian, I harbor a secret desire for the oil prices to stay a bit higher, to accelerate a shift to renewable energy and reduce the amount of inefficient land development that occurs. In the long run, I believe solar and other similar forms of energy will prove to be cheaper than oil and gas, because we have an unlimited supply of free sun, and the panels require far less labor per kWh of energy to maintain than oil rigs. We shall see.. Either way, I think the energy future is bright for us, and I’ve got an article called “Mr. Money Mustache vs. Peak Oil” that will get finished some day to share some more of these optimistic ideas. Fast forward 5 years (2016). The price of oil is at $30/barrel, we already have a few electric vehicles on the road and the auto industry bets more and more on fuel efficiency. MMM was right this time, too. In other words, unless we come up with much more efficient processes for fracking, drilling, dealing with tar sands, etc., peak oil will become a very real phenomenon in our lifetimes (in my opinion) regardless of how much is left in the earth. I’m a huge proponent of renewable energy, and like MMM, for years I’ve been paying a higher rate for renewable-based energy to be delivered to my home. It’s not because I had a lot of money to burn (I was a graduate student up until very recently) – it’s because I think investing in it and expanding our base of it is that important. On the flip side, even if the whole country/world got its electricity from solar and wind, we still wouldn’t have a viable alternative to oil for many other industries (plastics, lubrication, etc.). But, if we pull off the huge burst in renewable electricity sources, the oil we do have will last a heck of a lot longer for those other industries. Indefinitely, if we make the transition quickly enough (which I think is very unlikely). One interesting problem about saving small regular amounts is trading costs. It seems only worthwhile to invest in batches of $500-$1000 or your trading costs are going to eat up most of your first year gains. I actually wish there was a way to regularly invest small amounts of money. The best thing I found so far is ing sharebuilder, but even that costs $4 per trade. That’s a good point, if you are buying shares in individual companies. But if you have a Vanguard account, you can buy and sell their funds with zero fees and the minimum transaction amount is very small – something like $100 or $250. Since I’m an index fund advocate anyway, I think the whole trading costs issue is something most people don’t have to worry about. TD eFunds allow you to setup a Pre-auth (PPP) contribution from your TD bank account for as low as $25 each transaction (I’m doing this with the kids’ RESPs). Non-PPP transactions typically have minimums of $100. You can also hold eFunds in a self directed TD Waterhouse RRSP as well as ETFs. So, during the year you could contribute to the TD eFund index funds to get some good dollar cost averaging and once a year you can re-balance into index ETFs for longer term holdings (and even lower MERs). I’m in the process of getting the RRSP eFund/ETF approach setup and would love to hear from others who might be doing this (or if it’s a bad idea). Try Charles Schwab index ETFs. If you have an account with them, there is no transaction fee, and their management fees are extremely low. I find it an excellent way to ‘trickle’ my savings into stock, bond, and REIT exposure. I recently started reading your stuff. I’m up to this posting after 3 or 4 days (my library book reading rate as suffered as a result, but well worth the diversion). Anyway, I have noticed that you referenced your preference of Vangard a few times. I have not looked into Vangard very much myself, but could you say if there are factors that drive your decision to use Vangard vs another discount brokerage (Schwab for example)? Is it simply the transaction fee / management fees that factor for you, or do you see other benefits? Thank you for your time. I look forward to continued reading. It’s mainly the Vanguard funds themselves that I’m interested in, and I’ve always used a Vanguard account to buy and sell them, since there are no fees at all for this (that includes Vanguard ETFs). Vanguard funds are just generally the industry’s cost leaders, and in index funds, expense ratio is everything. Also, Vanguard is a an amazingly ethical company. If you’re buying individual stocks or other ETFs, vanguard’s discount brokerage isn’t any better than other ones (I like Sharebuilder, a branch of ING Direct). I am trying to decipher how you obtain your compounded dollar figures from an annual average return of 7%. if you simply hold one index how does the amount ever compound…? MMM, I would encourage you to read up on the low volatility anomaly. Search for the following FAJ article: “Benchmarks as Limits to Arbitrage: Understanding the Low-Volatility Anomaly”. There is very compelling research that investors are actually rewarded for taking low risk in the realm of common stocks. The article explains the behavioural biases that create the effect and the institutional deficiencies that allow it to persist. Market-cap weighted benchmarks like the S&P 500 guarantee that your portfolio is overweight overvalued stocks and underweight undervalued stocks. You don’t know which ones they are, but you do know your portfolio is loaded with this bias. Asset bubbles anyone? Naturally, implementing the low volatility strategy is more expensive than simply replicating a market cap index, which almost never has to be traded to maintain the strategy. I know in Canada there are some interesting alternatives (see TD global low volatility). These products are expensive and everyone has to decide if that premium is worth it. I haven’t made that decision yet but I am exploring it. Perhaps the US has better products for retail investors. So MMM, I want to challenge your conventional wisdom on annualized stock increases over time. I agree that all of your figures look good, and really from a historic point of view, 7% was a fairly safe assumption to make. So I am going to ignore the worries of oil prices spiking, and all of those other things people normally focus on, to look at what actually drives the wealth – people. If you look at the world, predominantly North America and Europe, these two areas are the primary drivers of wealth over the past 50 or so years. If you also look at the world, these two areas also had the largest bulge of favourable demographics coming through them, as compared to any other region. I would like to propose that a lot of the growth that was felt was due to the workforce becoming more mature and skilled over time, combined with technologies, etc. Now look at where the world is going in the next 30 years. Proportionally North America and Europe are going to age rapidly, and for the first time there will not be a larger population of younger people to replace the older. This is in fact happening only in a few regions of the world, and China is not one of them (but India is). The end result is less people working, and if they are able to meet the same output, things stay the same, or there is growth, but it is anemic in nature and not the historic 7% we have all grown to know and love. The only way around this problem I can see is if technology is used to heavily boost the amount of wealth one worker can generate. However, there would then be less people buying as people age and die, so less consumption and the net result is a smaller economy, even with higher productivity. Actually in this case you end up with rich(er) workers using technology and several poorly paid people in areas where the rate of return for technologies is less than the cost of hiring workers. I agree, I think this will be the largest economic challenge over the next 50-100 years. Every industrialized nation, and most developing nations, have falling birthrates. Already most of Europe is under the replacement birthrate of 2.1 children per family, and their population is only growing because of immigration. Japan’s population is falling because they have a low birth rate and almost no immigration, and it is causing problems for their economy already. If everyone only had one child like MMM’s family, then the next generation would only have half as many people, which would be disastrous. That’s not to say that people shouldn’t have more kids if they don’t want them, but for every family that has one child, another family has to have three to make up for it. I’ve just started reading your excellent blog. I’ve read many investment books, and the one that I have found most helpful is William Bernstein’s “The Four Pillars of Investing”. It makes the case for asset allocation, then lays out exactly how to implement your plan. That is, it is both descriptive and prescriptive. Asset allocation addresses two of the most problematic investing decisions (which are really nearly the same thing): when to sell and how to maintain discipline in the face of market fluctuations. The basic idea is to define asset classes (large-cap U.S. stocks, small-cap value U.S. stocks, small-cap international stocks, REITs, bonds, etc. ), establish target percentages for each asset class, then use index funds to approximate each class. The key part is re-balancing to your chosen percentages ***on a fixed schedule*** (e.g., once per year), which forces you to sell from the asset classes that have increased in value and buy for the ones that have decreased. Buy low, sell high. It isn’t exciting; it’s simple and it works. Another way to re-balance your taxable portfolio is to just use new money to re-balance the accounts, thus avoiding capital gains by selling what you have. Of course, you need to have the money to do it, but if you have the money, it’s by far the better way to do it. Did you ever write an article for this topic? My wife and I are exactly in this situation. If you did not, what would you suggest to a married couple in their early twenties who are saving 50-60% of their income. I want to retire in the next ten years or so to do freelance work while my wife plans on working for quite some time. If someone invested $1 and earned 7% per year over a long time period, say 2000 years, how much money would they have today? There aren’t enough atoms in the Milkey Way to create that many dollars. 7% may be optimistic. Not to feed the trolls but there are a lot of problems with your equation as to why 7% is too optimistic. 1) 2000 years is an arbitrary number, we don’t even live that long, usually pair off, and then have offspring who would then divide the money. Good chances that the currency changes with globalization and the original dollar you invested doesn’t even exist anymore. 2) comparing it to the number of atoms in a single galaxy out of 10^11 galaxies is just as arbitrary, we could say that it is too optimistic because thats more than the number of squirts of ketchup annually consumed at sporting events. 3) there are approximately 10^69 atoms in the Milky way, about 10 orders of magnitude more than 1.07^2000 gets you (5.8×10^58). You may argue, well I mean the number of atoms in dollar bills to make that figure. That would get us close to the same numbers, 4×10^70, within an order of magnitude if we take the only figure I could find so far as 700 billion atoms in a dollar bill, I’m assuming they mean a nice crisp one off the factory and not one that’s been jostled around quite a few times or has a corner torn off. This ignores the existence of 100 dollar bills, or that in face of inflation single dollars may become obsolete and 1000 dollar bills take over as is the case in Asia with Taiwan having a 1000 dollar bill used as basic currency which is equivalent to how we treat $20’s in the US (to be accurate the exchange rate makes it more like $33 USD depending on fluctuations). At a 3% inflation rate you will need 2060 in 2000 years to equal the buying power of a single dollar, so assuming that we haven’t reset the dollars by then, we would have 1000 dollar bills be equivalent to a 50 cent piece, possibly even having 100,000 dollar bills (about $50 in today’s money) as standards of currency. Now if we figure that we are a bit smarter than having a currency which exceeds the number of atoms in our little galaxy we probably would have moved on to digital currency long before that even becomes an issue, as we largely are now since the use of fractional reserve banking causes most money to literally be pulled out of thin air and exist in computers only. I just find comments like the above to be worthless and add nothing to the conversation. It’s comparable to combining random statistics on two different topics to try to prove a causal relationship where none exists. As we all know global warming has caused the pirate population to die out. True, if you bought 10 years ago and just held, you were up only a couple percent. But if you constantly bought that $25 weekly (or $100 monthly or whatever) you’d often buy at lower than the beginning/end price and make a lot more profit. Dollar cost averaging comes to mind. HI there. New viewer to the blog. Interesting that this post was written in 2011. It would be interesting to see what returns have been the following 3 years. My initial thoughts would be that your 7 % return would be well exceeded. You guessed it right, Blackcap! Since writing this post, the S&P500 index is up over 53% including dividends, which is a 16%+ annualized return. Then there will be a crash, and a bunch of flat years, and some more spikes like this one. But it is bumper years like the last three that average out and make it all worthwhile. It is essential to be invested while the getting is good. Yes, but would you better off waiting with cash to buy post-crash then investing now at the peak? People say that’s “market timing” but the timing of entry and buy and hold I think is the most important element. If you have patience and can wait you’ll buy many more shares for your dollar. In any case it’s practically deflation out there so money isn’t losing as much value as some say it is. Then there’s also the “transactional value” of cold hard cash as Mark Cuban points out — getting discounts and buying bulk = percentage of returns gained by using cash. What I’m saying is that if you have a lump sum to invest, it’s better to hold cash right now then to buy into the market. At some point, you will be right. But plenty of people said the same thing when I first wrote this article 3 years ago. The thing is, you can’t predict if we are 1 day or 6 years from a 50% market crash. On average, you lose by trying to make that call. Keep reading! There’s an old expression: Time in the market is more important than timing the market. Now look at the returns just since 2015! Calculate how much the guy you replied to lost if he didn’t invest in 2015 when he thought the market was too high. You should consider doing a follow up post on this post. This post was nice to read following the previous year. I just invested 50% of my income at the peak of the market in 2015 and have since watched it well, not grow. Despite knowing the logic that the market fluctuates, losing money is not an easy thing to watch happen. nice post. I do have a question, though (and perhaps other readers can help me out if MMM doesn’t see this himself). Here you’re talking about 7% return AFTER inflation, but elsewhere you talk about 7% return BEFORE inflation. Why the disconnect? Is it just to be conservative, or am I missing something here? How many percent do you recommend should be invested vs. cash in bank?